With only 25 days on our Chinese visa, we did this trip way faster than we wanted to, and were probably a little bit too ambitious about the distance we wanted to cover. 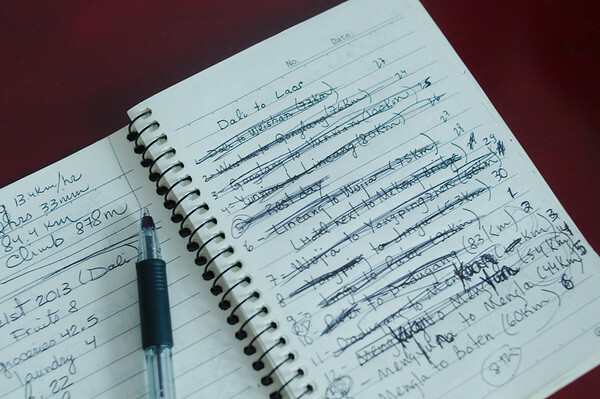 We ended up cycling 20 days, including a consecutive 11-day stretch. There isn't a flat kilometre in the province, but we were rewarded with empty highways, good quality roads and unbelievable scenery (for the most part). Here's our summary with some additional info at the end. Had we done a little bit more planning ahead of time, we might have cut south towards Laos directly from Kunming allowing for a more leisurely pace. But we were keen on cycling the western part of the province and we thought we might enjoy a break in Old Dali. The G320 highway runs roughly parallel to the expressway that absorbs most of the traffic heading west from Kunming. We shared the road with locals who were avoiding the expressway tolls or moving between villages. We hoped to complete this ride in four days, but with all the climbing it took us five. 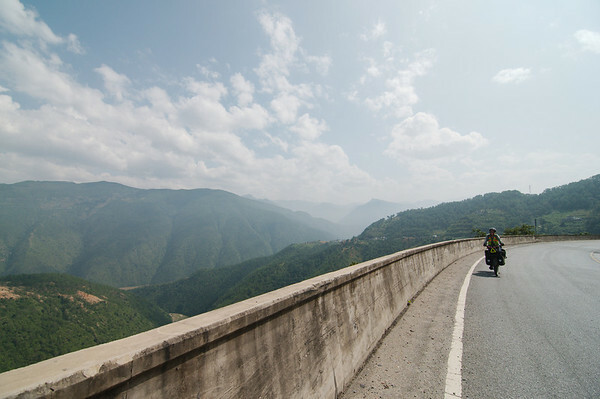 This road is probably the busiest and the least scenic of the highways we rode in Yunnan. The cities which seem to be plopped down in the middle of nowhere were truly uninspiring. 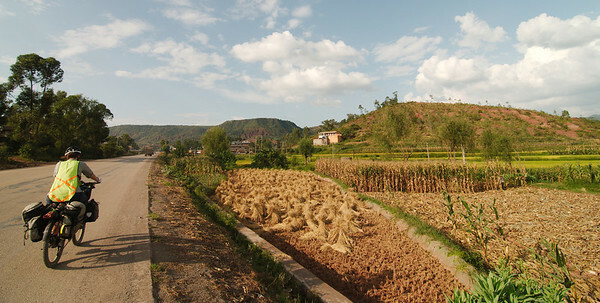 Luckily, most of the ride was through rural countryside which was far more picturesque, although not immune to the plague of Chinese urban development. We knew that Old Dali would be busy and probably disappointing. But we planned to stop there any ways to enjoy the comforts of our last major tourist destination in China. This basically meant eating hamburgers and having an internet connection with a functioning VPN. We had visited Old Dali seven years earlier, and we found the city to be completely transformed. It was overrun with tour groups and expanded with horrible Chinese construction. In our opinion, Old Dali can be skipped, although it's a good place to do laundry, eat western food and get your internet fix (see notes on internet below). We only spent a day and a half on this secondary road before rejoining the national highway at Nanjian. We chose the route so that we could stop in the town of Weishan, which we had read was worth a visit. Signs advertised it as “Weishan Ancient Cultural & Historical Town” which we assumed would mean that it was a tourist trap. We were pleasantly surprised to find it unaffected by its designation. It has a quiet, charming old quarter which we wandered through all afternoon without seeing more than 2 or 3 tourists. We spent three and a half days on this highway complete with several full-day climbs. 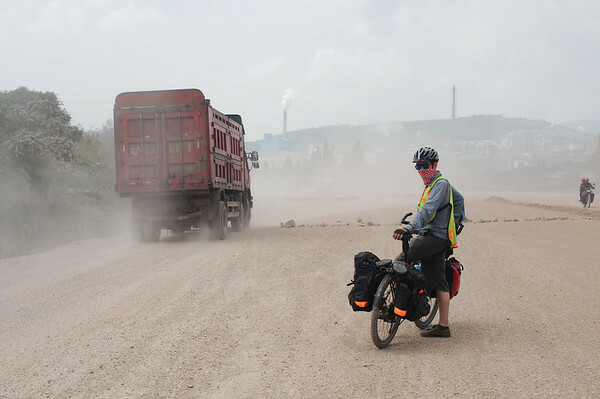 Although the traffic was fairly sparse, the trucks struggled up the hills and blew lots of thick exhaust at us. We also had to cycle through a fair number of long, unlit or dimly lit tunnels which were slightly unnerving. The positive aspect of them being dark was that the drivers seemed to be as nervous about being in them as we did and drove really slowly. The cities we passed through continued to be uninteresting, but the sections of raised highway through the mountain were epic, especially when we were on a descent. We spent a rest day in Lincang, not because it was a nice place to stay, but because we were exhausted from all the climbing. 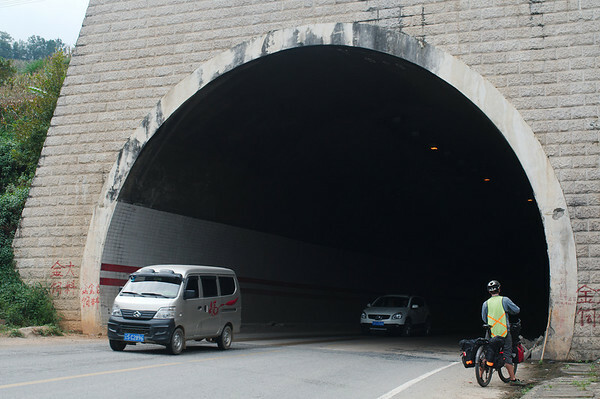 Instead of following the G214 we decided to cut east across central Yunnan in order to shave a few hundred kilometres and a few days off our ride. We ended up on a beautiful quasi-abandoned stretch of highway that was free of truck traffic, tunnels and ugly big cities. 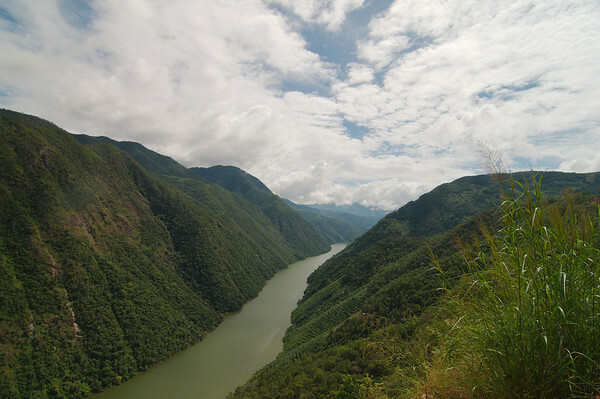 From Lincang we had one of our most epic descents, over 1000 metres to the Lancang (Mekong) River, with spectacular views of the river gorge cutting through the mountains. We slept in a quiet motel and watched the morning mist rising from motel balcony. Other nights along this highway were spent in pretty basic truck stops, where the dark quiet nights in the mountains were enough to compensate for the mouse poop in the sheets. 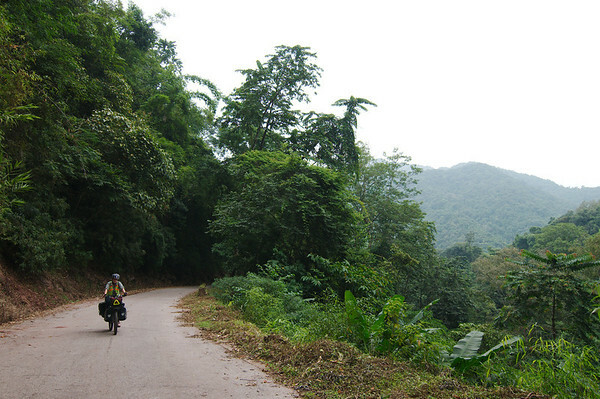 Much of the G213 highway runs through the Xishuangbanna Nature Reserve where the jungle is left untouched. Tree-cover shielded us from the sun, although the humidity was a lot higher than further north in the province. The climbs were much shorter though, which was a relief because we were starting to feel the effects of cycling for over a week without a break. We didn't camp at all in Yunnan. Any flat ground that we spotted was usually occupied by rice, corn or tobacco. In many areas, the highway climbed through the mountains, with steep cliffs on either side of the road. Probably the only camping option would have been to ask villagers to sleep on their land. 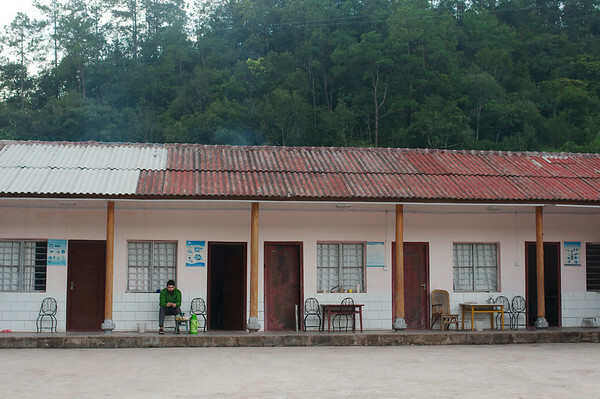 In Xishuangbanna there were a few more suitable looking camp sites. Other than highway G213 (where we slept in the towns), there were truck stops in even the smallest villages. They are usually unsigned, but you can easily distinguish them from village homes, they are long one-storey buildings with several side-by-side rooms. They come with shared bathroom facilities and very basic rooms, but usually a hot, solar-powered shower. These are a step up from the truck stop in that they have private bathrooms. 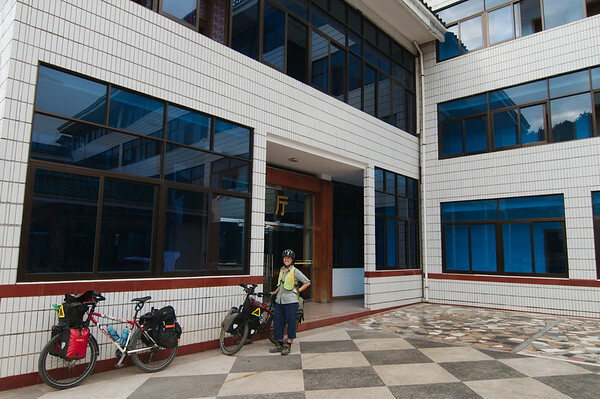 We had great, clean budget hotels with hot showers for most of our trip, usually for around 60 yuan a night (about $10). We could often roll the bicycle right into the room fully-loaded which was great for quick morning starts. In mid-sized towns, the hotels in our budget price-range tended to be a little bit crustier, but for the price we were completely satisfied. Apart from the major tourist centres of Dali and Kunming, if you aren't a Chinese National, surfing at an internet cafe has become nearly impossible. Chinese ID cards are now equipped with an RF-ID so that they can be scanned right into the system at every internet cafe. The cafes are totally depressing, filled with mindless automatons smoking for hours on end while playing video games. The connections are terrible because no one is actually surfing, they're all just battling each other in locally networked video games. Only at a few places were we given permission to use the computer, but we felt uncomfortable surfing because we didn't want to get the cafe owners in trouble. At one place, the employee hovered around Yann as he was reading the news. Using an online translator, he managed to transmit the three-word message “few pieces opinions”. Ok, we understand. There are restaurants everywhere in China. We tried to seek out refrigerated food display cases where all the available food items are on display. The fridges are perfect for ordering if you don't speak Mandarin because you just point at what you want. We tried a huge variety of vegetable dishes, almost all of them spicy. 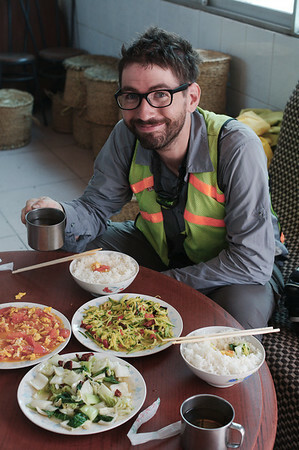 We usually paid 10 yuan for vegetable dishes and 20-30 for meat dishes. But we didn't really bargain. In bigger towns, breakfast stalls selling steamed buns and/or dumplings lined the streets and set up very early. But elsewhere we had to plan for breakfast the night before by stocking up on fruits and store bought cakes. We would advise against buying the popular “French bread” unless you are looking for something that is very much not French bread. The best cakes we found we found were the “Daliyuan European-style cakes”, available at most mid-sized road-side shops. Even better were the homemade peanut cakes or date bread that we found a few times in local markets. 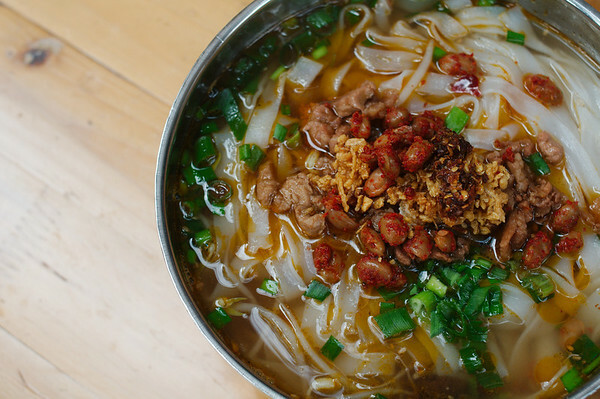 Once we discovered the Yunnanese noodles with self-serve toppings we ate them almost every day. Unfortunately the noodle vendors tended to close up shop pretty early, often before lunch time. We changed money on the Chinese side at a large money exchange building. We got an amazing rate, actually better than the official rate, which was perplexing enough that we thought we were being cheated. We avoided the numerous money changers hovering around the border. On the Chinese side, in order to get our bicycles across the border we had to first pass customs (leaving our bicycles outside). Once we were stamped out, we could exit through the vehicle lane after showing the border guards our passports. Similarly on the Lao side we had to leave our bicycles outside, go through customs, then exit through the vehicle lane. We advise not riding your bicycle through the vehicle lane, you have to walk it through unless you want a stern talking to. Wow the landscapes look amazingly beautiful. Really looks tough. But some beautiful photos. Why can't I comment on the photos?